As I said in a previous post, I recently moved to Paquis from Eaux-Vives. Paquis is a popular, diverse, lively blue-collar neighborhood. I love it. In the Spring/Summer, there are people everywhere, and restaurants’ terraces are crowded with people. Anyway, new neighborhood means I have to find a new coffee hangout because as I’ve told you before, I am a sucker for a good latte. Unfortunately for me, Paquis does not have a big choice in terms of coffee shops. There is Boréal next to the train station, which I love, but the place is too small to sit down and chill. It is more of a to-go scenario. And then, there is Le Fix. It is a bit further than I would like, but a nice stroll by the Lake is always enjoyable. 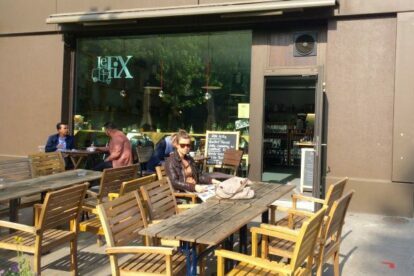 Le Fix started as a coffee truck driving around Geneva farmers markets and they opened their cute and cozy coffee shop in 2014. A big plus at Le Fix is that all their products including their coffee beans are locally sourced in Switzerland. The latte is good, the homemade raspberry muffin I had this morning on their nice green terrace was also very tasty. For lunch, they have two affordable options: a quiche or a sandwich or a soup with a salad for 16.50 CHF. It was my first time at Le Fix but I think it definitely has the potential to become my regular coffee spot!